As a little girl, Oh Mi-sun’s train conductor father was deemed responsible for a commuter train wreck that killed 100 or so travelers. This coincided with her birthday. (Looks like no B-day present from papa this year.) This causes Oh Mi-sun to internalize inner shame for 15 years. Now old enough to get a job and buy her own dang presents, she takes a position as an attendant assigned to ride on this particular train’s last run. Oh, yeah — several of the train cars not damaged by the wreck all those shame-filled years ago are the very ones she’s serving Sapporo™ and squid snacks on. What are the odds? 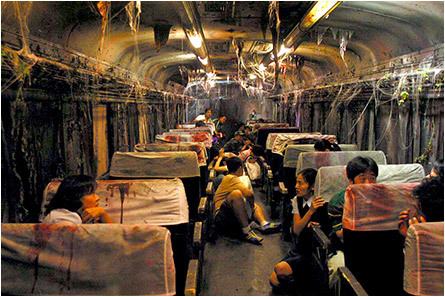 Slowly, Oh Mi-sun starts having visions of dead people on the implied haunted train (they better have a ticket). Along the way the choo choo stops on the track to let a little ghost girl go by — long enough to allow the ghost train behind them to merge into a “two-for-one” hell ride. In a pace made for ghost snails, it comes to our attention that the conductor also had links to the past ka-BOOM. 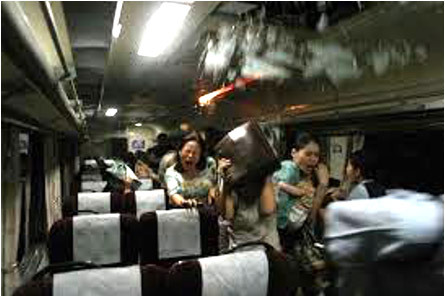 Then several more passengers are given time to associate themselves with the historic disaster. Things finally pick up as the ghost train and the regular train come to their proposed conclusion (see, “ka-BOOM!”). Oh Mi-sun’s dead dad re-appears for a look see, as do several other dead-yet-breathing passengers. Normally a ghost train movie would be a welcome site to my sore TV. Not this one. 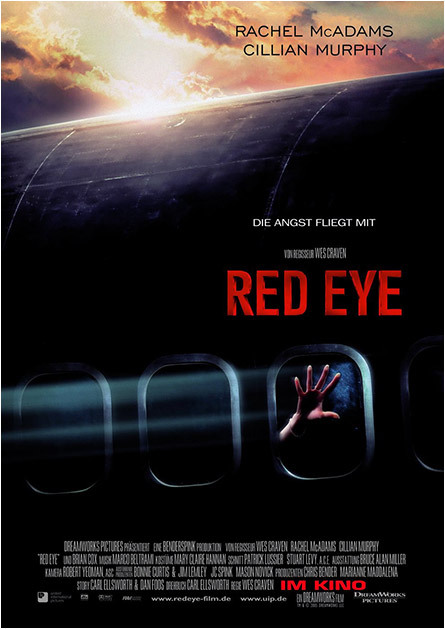 South Korea’s Red Eye (2005) is slow, patience-testing and filled with coach-class special effects. By the time it was over I felt as though the ghost train had left me at the station. All a-bored. P.S. I challenge you to not confuse this Red Eye with the U.S. Red Eye, with the same title and released the same year. This one takes place on a plane. That rhymes with train, so I can see why you might be flummoxed. This entry was posted on November 14, 2016 at 5:41 pm and is filed under Asian Horror, Foreign Horror, Ghosts with tags Asian Horror, Foreign Horror, Ghosts, haunted, Oh Mi-sun, poltergeist, Red Eye, Sapporo, South Korea, spirits, train. You can follow any responses to this entry through the RSS 2.0 feed. You can skip to the end and leave a response. Pinging is currently not allowed.